We’re going to talk about a for-and-aft rigged ship, the most common sort of pirate ship. Imagine a ship with a single triangular sail, just like the sailboats you drew as a child. The wind blows from behind, the sail stretches out, and the boat moves. You imagine that the sail is being pushed by the wind. It is not. It is being pulled by a vacuum formed in front of the sail by the moving wind. Much the way an airplane is being pulled into the sky by suction on top of the wing. The sailors did not understand why this worked, but they knew how to use the way it worked. By changing the angle of the sail to the ship – rotating sail around the mast - they could harness the power of the suction to move the ship at right angles to the wind. If the wind is blowing from the north, a ship can sail due east or due west with no trouble. But how do you go north? 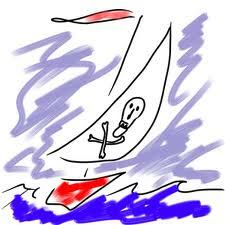 No matter how much you adjust the angle of the sail, you cannot sail directly toward the direction of the wind. But by fine adjustments the ship can sail at less than a 90 degree angle to the wind. Into a north wind, a ship can sail northeast of northwest. This is called sailing “close to the wind.” The “closer” you were sailing to the wind, the more near you were to sailing directly in the direction the wind was coming from. Still - how do you sail right into the wind? Well, if the ship is traveling northeast, and suddenly turns into the wind, it will, if properly handled, face due north for a second, then keep turning to the west until it is sailing northwest. Keep doing this, and the ship follows a zigzag track, which averages out to due north. This is called “tacking.” The only problem is that because of the zigzag motion, the ship has to sail roughly three times the distance. A ship that can sail closer to the wind, more nearly right into the direction the wind is coming from, can travel “faster” by traveling in a shallower sort of zigzag. A ship with the moveable, triangular sail can always travel closer to the wind than a ship with square sails, which are not as adjustable. This is why, in spite of what movies tell us, that pirates preferred the triangular-sailed (for-and-aft rigged) ship over the bigger square-rigged ships. By sailing close to the wind, they could travel “faster” while moving at the same speed. They could (so to speak) make the kessel run in 12 parsecs. What Makes a Pirate Ship Sail? Hold it, how did they do that? Sailing ships are powered by the wind. It’s easy to understand how a ship sails away from the direction the wind is blowing.